Provide comfort for the family of Mary Knowles with a meaningful gesture of sympathy. 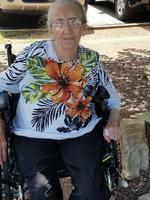 Mrs. Mary Lee Knowles age 88 of Douglasville passed away December 20, 2018 Funeral Services will be held Saturday the 22nd at Bellamy Chapel Hiram at 2:00pm with Rev. Matt Rayburn and Pastor Jeff Childers officiating. Interment will follow at Dallas Memory Gardens. The family will receive visitors Saturday 12-2:00pm at the funeral home. Mrs. Knowles was a member of Mount Tabor Baptist Church in Taylorsville. She is preceded in death by her husband Thomas H. Knowles Jr.
To plant a memorial tree in honor of Mary Knowles (Akins), please visit our Heartfelt Sympathies Store. I remember your soft voice, the dress you made for my 8th birthday, and your wonderful chocolate cake. Prayers and love for you, my cousins, and aunts as we say goodbye.